Our extensive online catalogue features hundreds of products in many different categories, all made of high-quality materials & offered at prices you can't find anywhere else online! Slimline Warehouse is a national leader in POP, POS, retail, & exhibition displays, offering same day despatch with most in stock products that are purchased by 2pm EST to anywhere in Australia, including Sydney, Melbourne, Perth, Adelaide, Brisbane, Hobart, Gold Coast, & Canberra! 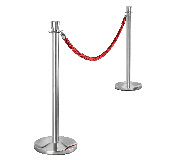 This red rope stanchion set, like crowd control stanchions and rope, makes it easy to create different configurations at your location thanks to the (4) slots for attaching ropes on top of the posts. The barrier posts are made from steel for long-lasting use in public areas, and have a silver finish for a professional appearance. Stability is achieved thanks to the bases being weighted, with a rubberised bottom as well that helps to prevent scratches to the floors these displays are used on. 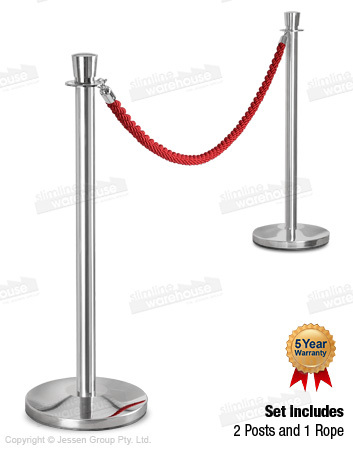 This red rope stanchion set uses a 2m long red braided rope to connect the two stanchions, a striking colour that is easily seen by visitors. 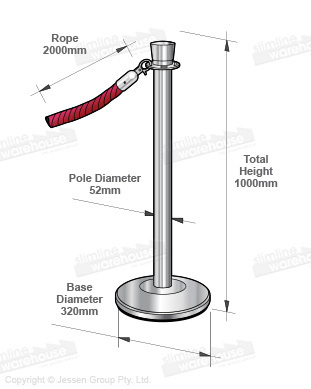 The queue barriers have clasps on each end of the rope to attach to the stanchions securely, with employees able to easily undo the clasp to allow visitors into VIP areas. Order today for your museum, cinema, exhibition hall, car dealership, nightclub, shopping centre, or art gallery!